Autumn is all about the light. As the sun drops lower towards the horizon and the temperatures fall, we get longer shadows, shorter days, mists, dew and sunlight filtering through the leaves, falling obliquely to light up the last summer flowers like jewels. I've been dreaming of a pond for the garden for ages but today that dream is a step closer. This huge, now empty, flowerbed will be the site for it. It is surprising just how much space the flowerbed took up in the lawn and half of it will be reseeded with grass. It is sad to see the QMMFB go but it had outgrown it's space and usefulness. All around are reminders that summer is over, not least of all the virginia creeper that is putting on a fantastic show this year. Three award-winning writers feature in the very first Rochester Literature Festival, an eclectic and imaginative ten-day programme of events inspired by the overarching theme, ‘Other Worlds, Other Voices’. The festival begins on 3rd October to coincide with National Poetry Day and runs to 13th October. The festival opens with multi-award winning, Guyana-born writer Maggie Harris reading from a selection of her moving, resonant work in celebration of Black History Month in the first of two events in association with Medway Libraries. Maggie Harris is now based in the county of Kent and she has won countless accolades for her work, both at home and abroad. She will also be leading a participatory poetry workshop on Saturday 5th October. In the evening of 5th October, Rochester-based Sarah Hehir, who won the 2013 BBC Writer’s Prize for her radio play ‘Bang Up’, first broadcast on Radio 4 in August, will attend a rehearsed reading of the play featuring actress Emma Dewhurst (‘Parade’s End’, ‘The Iron Lady’) as part of A Night at the Theatre, which also sees the re-launch of 17percent’s ‘She Writes’ initiative with their new comedy play showcase What’s through the Door?, inspired by an HG Wells’ story. The following Saturday (12th October), we present an evening with Bill Lewis, original Medway poet, painter and storyteller. Bill won the Literature category in the Medway Culture & Design Awards 2012. In The Hero’s Journey – A Call to Adventure, he will share his great knowledge of magical realism, metaphor and myth, referencing his own life and work, and contemplating Joseph Campbell’s famous vision of the hero’s journey and how the idea impacts on literature and film. In addition to our headline writers, two highly original events promise to entertain over the festival weekends. The Skywatcher Investigation is an interactive story game on Sunday October 6th, where the audience will follow clues to various tableaux in locations in Rochester High Street, before being directed to a final performance. For Alice, the festival’s final event on Sunday October 13th, contemporary and ballet dancers will interpret excerpts from the ballet Alice by composer and musician Jacob Bride, who will lead members of the City of Rochester Symphony Orchestra and local band, Brides of Rain. New writing, both prose and song, based on Lewis Carroll’s eternal tales of the young girl’s journey through his strange and wondrous land, will also feature in this three hour, drop-in special to close the festival. The festival also includes three very special events produced by ME4Writers: the launch of their eagerly awaited book, City Without a Head; a participatory creative writing tour of Rochester, Write Around Town, and a welcome return of Poetrymon, where members of the public can search for handmade poem-cards hidden throughout the Medway Towns. There will be further opportunities for people to hone their writing skills in a number of word-related creative writing workshops: writer Philip Kane leads From Sorcery to Starships, a fantasy and sci fi workshop and an informal writers’ games night Play: Write. The RLF team will also host another version of their successful readers’ and writers’ Potlatch. Alongside the literature events, an exhibition entitled Other Worlds, Other Voices, runs between 5th – 12th October at Rochester Community Hub and Library. While some events are free, they may require booking due to limited numbers. Other events have a small fee to cover venue costs. 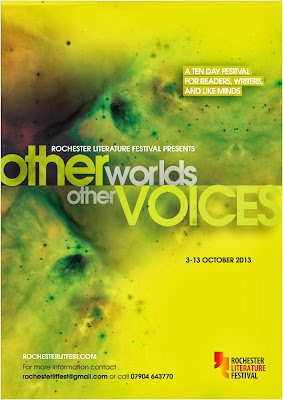 Please visit the ‘Other Worlds, Other Voices’ page at rochesterlitfest.com for links to find out more about each individual event, and to book tickets. For more information about festival organisers click on logo above. Good grief... I've lost a movie review! The dream within a dream... not since The Matrix has sci-fi and CGI fitted so well together. A mind tickling maze of a thriller and a roller coaster ride of action from start to finish. Leonardo DiCaprio plays the lead character Cobb, a fugitive thief who needs to steal company secrets from inside someone's mind in order to return to his old life. He gets a team together for this one last job but fails to let them know the danger they all face, haunted by an enemy of his own making. Ellen Page, Tom Hardy, Joseph Gordon-Levitt, Ken Watanabe, Cillian Murphy, Dileep Rao to name a few of the great cast list all give strong performances but for me, Marion Cotillard is brilliant as the vengeful Mal. An atmospheric and memorable movie, complimented by a beautiful soundtrack. A mind boggling five out of five stars. Beautiful soaring musical landscapes from the movie soundtrack. Several years later, still listening to it and loving it. A top score of five out of five stars.